Strangely enough, as soon as my skirt style challenge ended and I could go back to wearing trousers, I didn't want to! I put a pair on and tried to style them up but just felt more inspired with the skirts I had, especially after having a play around making image sets on my Polyvore. Anyway, I reached for this Primark dress which I wore last week, with heels and a jacket, and, inspired by my aforementioned Polyvore playabout, decided to make it worthy of a shopping trip. I do wear heels a lot but after I had a car accident last year I have found that if I wear them for an overly long time I get really bad back ache. So if I decide to go into town, I normally walk as I live within fairly easy walking distance of the city centre, so I wanted to wear something that wouldn't cripple my back! These leopard print pumps are from Boden and totally perfect for day to day wear. I actually wanted some white Converse but I couldn't find any that were within my price range so I got these instead. They totally satisfy my leopard print love in a non-obvious way and I think they make this skirt/dress blatently daywear. Love it! 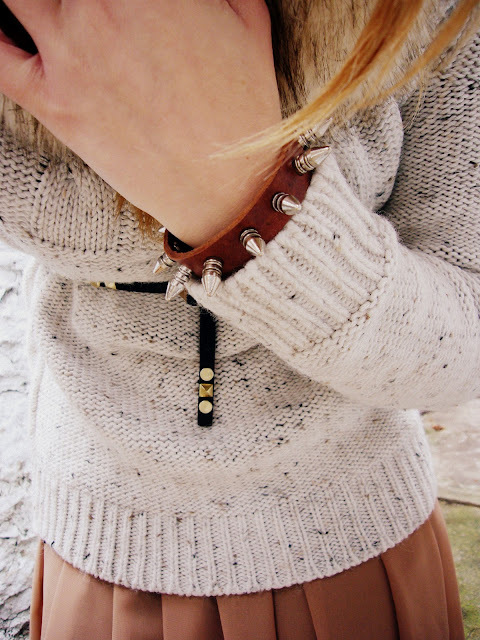 I am rocking this wicked studded/spiked leather cuff which I got from online fashion site OASAP. It's a really cool site with loads of quirkly little bits and bobs; check them out if you have time here. When it came I was a little concerned that it was a bit gothic for my tastes but I think it looks ok with the more girlie outfit. I wouldn't wear it with my leather pants mind! The snood was a gift from my mum-thanks mumma-and I'm not going to lie, I have worn it constantly ever since she gave it to me, so you might have to get used to it because i'm never taking it off. Plus I had a really short trip home last week to see my family and managed to leave my cotton bud hat and gloves behind, so I also need to wear this as matters of practicality! It's gone so cold again and I hate being cold! Thankyou to everyone who's left me a lovely comment lately! And a big hello to all my new followers! You take such great pictures!